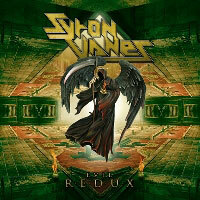 Review: "Syron Vanes: Evil Redux" - Sea of Tranquility - The Web Destination for Progressive Music! Sweden's Syron Vanes have been around since the early '80s, originally appearing on the NWOBHM label Ebony Records with their first two releases Bringer of Evil and Revenge, but now finding themselves many years later on Denomination Records for their fifth album Evil Redux. The band, Rimbert Vahlstroem (Lead Vocals, Guitar), Anders Hahne (Guitar), Mats Bergentz (Drums), and Jakob Lagergren (Bass), play a style of heavy metal that's not unlike some of their contemporaries from Britain back in the day, like Iron Maiden, Judas Priest, Grim Reaper, and Saxon, so expect lots of crunchy riffing, galloping rhythms, and anthemic vocals throughout Evil Redux. If you like classic metal sounds, chances are you're going to get a lot of mileage out of this CD. It's not hard to get into headbanging form with tracks such as "Sacrifice", "Only Hell Remains", "Hellion Child", "Heaven and Back", and the grinding "Bringer of Evil". Plenty of tasty, crunchy riffage throughout the album courtesy of Vahlstroem & Hahne, and with the spot on production it only raises the enjoyment factor. Vahlstroem also has a decent voice, and he's able to deliver a few different ranges here, from Rob Halford's upper register & low growl to Bruce Dickinson's soaring mid range, though at times you can hear his Swedish accent which might be a distraction for some. My one gripe with Evil Redux is, with 14 songs, there's just too much material here, and a few songs just sound thrown together and come across as rather generic & filler. That being said, there are plenty of strong classic styled metal anthems to be enjoyed here, so if that's your bag I can easily recommend this one to you.